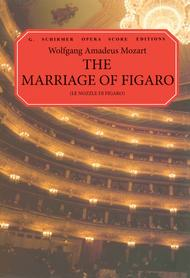 The Marriage of Figaro composed by Wolfgang Amadeus Mozart (1756-1791). Arranged by Ruth & Thomas Martin. For Piano, Vocal (Score). G. Schirmer Opera Score Editions. Classical Period and Opera. Difficulty: difficult. Vocal score. Vocal score, piano accompaniment, introductory text and lyrics. 481 pages. G. Schirmer #ED2021. Published by G. Schirmer (HL.50337720).ISBN 0793512085. With vocal score, piano accompaniment, introductory text and lyrics. Classical Period and Opera. 7.5x10.7 inches.Italian/English. Translated by Martin.